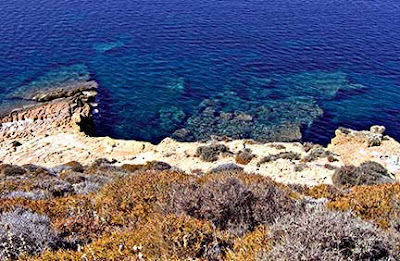 By summer’s end, the hills of the Greek island we call home are painted in golds and browns. 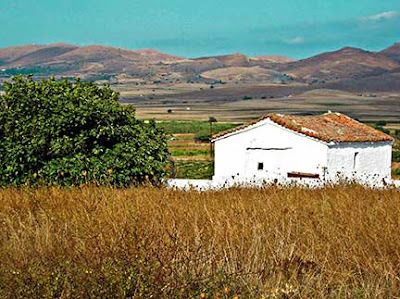 Patches of green appear only in the island’s narrow valleys, its vineyards, and the ubiquitous fig trees. Until we remodeled my husband’s grandmother’s house in Greece, I’d spent my life in the maritime regions of the Pacific Northwest and Alaska. For me, natural beauty meant lush foliage, evergreen-lined shores, and snow-topped mountains. It took me years to appreciate the subtle beauty of dry Mediterranean hillsides. And appreciate I do. Joy fills my heart when we begin our approach to the island’s tiny airport and I get my first glimpse of its golden hills. Without trees to obscure the view, the deep blue Aegean sky and sea are constant companions. Their brilliant blues combine with the burnished gold landscape and lazy cries of circling birds to induce an overwhelming sense of peace and calm. We walk in the morning, before the sun’s heat makes outside forays intolerable for my fair Alaskan skin. In September, a month we are always in Greece, prickly, inhospitable plants dominate the hillsides, so we walk on the farm roads surrounding the village. Spiky plants abound in late summer because they're the only ones that survive the constantly grazing sheep and goats which scour the fields of more forgiving flora. It’s difficult to begrudge the grazing, knowing it’s responsible for the full-flavored sheep and goats milk that villagers turn into excellent cheeses. Cheese is ever-present on village tables. Each meal is accompanied by chunks of white cheeses like kalathaki or feta, or harder cheeses like melixloro, ladotyri, or graviera. Saganaki, fried cheese served with a squeeze of lemon, has long been a favorite island appetizer. In recent years, a new-to-the-island appetizer called Bouyiourdi (boo-your-DEE / Μπουγιουρντί) has conquered the hearts of island taverna patrons. 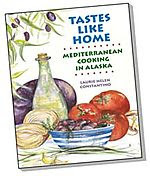 Although Bouyiourdi is now popular on the island, I first learned to make it in Alaska from my friend Maria Baskous, who learned it from her friend Lily Koukourikou of Thessaloniki. Bouyiourdi is feta baked until hot and creamy with slices of tomatoes and spicy hot pepper flakes. Last year, at our final island dinner before returning to Alaska, our table of 12 downed three orders of Bouyiourdi in quick succession before even looking at the many other appetizers gracing the table. Back in Alaska, I often bring Bouyiourdi to potlucks. It’s one of my most requested recipes. As I tell my friends, Bouyiourdi may be dead simple to make, but it’s dangerously addictive. Consider yourself warned. Measurements are provided as a rough guide but, in truth, I never measure anything when I make Bouyiourdi. I layer 1/2” slices of feta in whatever baking dish I grab, sprinkle it with oregano and red pepper flakes, layer it with tomatoes and peppers (or green garlic as shown in the picture), sprinkle it with more oregano, drizzle it with olive oil, cover and bake. You can also bake Bouyiourdi in aluminum foil packets. Cover the bottom of a baking dish with slices of feta. Sprinkle with half the oregano and all the crushed red pepper flakes. Cover with slices of tomato and peppers (or green garlic). Sprinkle with the remaining oregano and drizzle with olive oil. Cover with foil and bake for 20 minutes. Remove the foil and bake for 5 – 10 minutes, or until the cheese and oil are bubbling. Serve immediately with slices of bread. NOTE on Feta: In the US, my favorite fetas all come from Greece and are made from a mixture of sheep and goats milk. Dodonis is the brand I prefer. No matter where it’s from, the best feta is kept in brine until it sold and is available in specialty cheese stores, ethnic markets, and groceries like Whole Foods. If you can’t find feta in brine, buy firm feta in vacuum packed bags. Never buy pre-crumbled feta; too often it is made from the bits and pieces that fall off larger pieces of cheese. Feta takes two seconds to crumble in your hand, so you don’t even save any time when you buy the pre-crumbled stuff. As for “lite” feta, don’t even think about it. Amen to Bougiourdi...it's on practically every menu in & around Thessaloniki. I'll definitely look for this brand of feta -- the tomatoes are starting to be available at the farmers' market, and this will be a perfect summer dish. sigh...you're making me nostalgic even for the most sweltering Greek summer days. And I've never tried this dish, but I know baked feta is fantastic! now that's something i've never heard of (or seen on a menu in crete). we buy vacuum packed barrel aged feta, having completely gone off the feta made by the major dairy companies (never barrel aged, always the wrong consistency). feta is also made in crete but never named as such, as it is now PDO, and crete has never been a feta producer. Love the photos and the recipe. Also wanted to tell you that your advice worked well. Once I got the hang of it, it went quickly. Tasted better (as you said) as all fish do when they have the flavor sealed in with head on. One of our favorites also. At a friend's taverna we even bought clay pots that we brought back to the U.S. with us so that when I made it it was as close to the "experience" as we could get. Love, love, love bouyiourdi! Beautiful post. The blue seas and golden hills are a sight to behold. I am going to look for Dodonis. Its such a lovely recipe. Thank you, as always, for an inspiring post. This has all the flavors I love, I can't wait to try it! Thanks for the info on the best types of feta to buy. I sometimes make this in the microwave, as was traditionally done in ancient times. Peter , it's my sense that the dish originated in Thessaloniki/northern Greece where hot peppers are more commonly used than in other areas of Greece. Lydia, yes, it's definitely best with perfectly ripe summer tomatoes. Kalyn, I hope you like Dodonis feta - it's terrific (and think I now understand what you're after with WHB - thanks). Maddy, sorting through pictures for this piece made me quite nostaligic too. Kat, I'm so glad you liked the piece and even happier that you might be a convert to whole, salt-packed anchovies. Once I tried them, I couldn't go back to the fillets. Cheryl, sure wish I had some of those clay pots. Years ago, the local bakery on the island made yogurt in clay pots and I'd collected quite a few, all of which broke years ago. (Yes, we're a family of breakers.) You're right - they add to the experience. Suganya, t'm so glad you liked the recipes and the pictures. Thank you. Pam, you really can't go wrong with spicy cheese and tomatoes. Lisa - you're so brave! Oh boy, Lulu, a way to shorten the time between when I start craving bouyiourdi and when I eat it - PERFECT. Bijoux, it was just last night that I was complaining about the absence of technology for teleportation! As for Kalathaki, it may be my very favorite cheese of all. Last year we brought 12 kilos back with us and finished the last package only a couple weeks ago. It's now less than 2 months until we leave for the island. I can't wait. It would have been such a great place to spend childhood summers - you're lucky to have those memories. Dodonis is a very popular brand here in Australia too Laurie. I can definitely see why this can be addictive. I wish I could find some *good* feta around here--this sounds like a tasty one! Bouyiourdi is one of my favorite appetizers, but I had never had it until we moved north. Now I am totally addicted. I kept telling my husband for awhile I needed to get a recipe to make it at home, but I think that would be very, very dangerous. We have a taverna here in the village that makes the BEST bouyiourdi, so no need to make it at home. But now I have a recipe in case we move away from here! Mmm.. I love feta, we always have a bucket of it in the fridge. This would be a great side for a grill night. I found your site while Google searching for a recipe for Watermelon and Feta for my barbecue tonight...but I've come away with so much more! 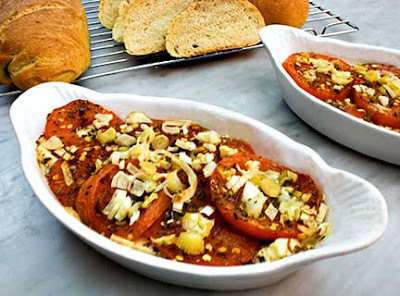 I plan on preparing the roasted tomatoes and feta for dinner now! I really enjoy your enthusiasm and look forward to reading more. Ah,Laurie...your photos and this post has made my ache for Greece even stronger than usual. When I'm having a bad day, I fly away in my mind to Lesvos. Thanks for a inspiring post and this recipe sounds easy enough for even busy me. Looking forward to more posts from Greece this summer, and sending you good wishes. Love this dish. It's something I'm going to try real soon. Wonderful job on this recipe! I can see this being very addictive. Gorgeous photos of Greece, especially the top one. I made yours/Abby's stuffed pork with spinach and chorizo on the weekend - it is very tasty, but I didn't have enough proscuitto to wrap right around, so it looks a little messy (and hence will not be photographed!!). Travel writer should be up there with cookbook author, and wild greens expert in your virtual resume! Our German friends first introduced us to the concept of grilled peppers, tomatoes and feta, and it is an addictive combo! I will try the oregano next time we do this too. I'm with you on your feelings about "lite" stuffs -- best quality in moderation is always better than diet stuff. Happy summer! this feta and tomato is DELICIOUS! and soooo simple and quick. i live in greece, but have never heard of it: would love to know in what area it's known and used. I made this tonight. (Will post tomorrow.) It is FABULOUS! I used fresh oregano. I accompanied t with seasoned shrimp. Such a wonderful summer meal. :) Thanks Laurie! Your post just captures everything summer. Fabulous. Oh, Laurie, I wish I had your rich vocabulary to describe our landscapes here! You make all sound so beautiful :D.
I think I could love this dish, eventhough it has Feta on it (I can't stand cheese) it looks so well combined and flavourful! The whole pre-crumbled feta cracks me up along with the pre-grated cheese. I am happy I found this blog because my goal for this quarter was start working with mediterranean cooking. Mike, try asking at your local Greek restaurants for where they buy their feta. Melusina, I'm glad not to be the only one with a bouyiourdi addiction! Natashya - hope you like it! Tif, thank you for visiting and I'm so glad to hear you enjoy the blog. Tay, good wishes received and much appreciated! Have you started planning your next trip to Greece yet?? :-) Maybe in 2009 or 2010? It would be a great way to shake off the travails of the last year!! js, hope you like it! Val, I can't make it as often as I'd like because once it's on the table neither one of us can stop eating it. Boo hoo. Cakelaw, glad you liked the picture. As for the pork, mine also did not come out very beautiful so I had to use abby's picture. But it sure tastes great! Manju, you made me laugh with the thought of a virtual resume! My goal is to never again need a resume...but if I do, I'm definitely putting on "wild greens expert!" Carole, this is a dish that came out of the Thessaloniki region (the use of boukovo is typical there). In the last few years, it's been spreading around little by little. Glad you like the site - where in Greece are you living?? Chris, seasoned shrimp with bouyiourdi sounds like a great combo! Glad you liked it. Nuria, my dad also doesn't eat cheese - you're the first person I've ever met that shares his aversion! As for your English vocabulary Nuria, it is quite impressive. You do a very good job. Jeff, glad you like the blog! And, yes, I agree with you about pre-grated cheese - it's hard to imagine why people pay the extra cost when cheese takes only seconds to grate.